I’m always getting asked how several species of closely related small silvery surfperch can share sandy beaches without tripping over each other. How do they partition the surf zone? Do they eat different prey, avoid each other? Maybe they find other ways to coexist. Our fascination with coexistence is well-founded; it explains why there are so many species. Joseph Grinnell, Director of the Museum of Vertebrate Zoology, UC Berkeley, was thinking a lot about this kind of thing in the early 1900s. In a series of papers, Grinnell developed the idea that different species with similar habitats and foods won’t coexist. The first use of the word niche, in this context, as far as I know, is seen in Grinnell’s 1917 paper on niche-relationships of the California thrasher. To Grinnell, niche was described by habitat, and was independent of species. G. Evelyn Hutchinson, in his famous “Concluding Remarks” paper in 1957, reframed niche as an attribute of species, and people pretty much think about it like that today. In 1932, the Russian, Georgy Gause, published results from his experimental work with mixed populations of Paramecium and yeast. Gause’s work showed that two species competing for the same resources can’t coexist, all else being equal. This is an idea people sometime refer to as Gause’s law. Gause wasn’t influenced by Grinnell’s ideas. He was a mathematical ecologist fascinated, at that time in his career, by factors that influence population growth curves. Nevertheless, Gause’s experimental results were consistent with Grinnell’s field observations. Garrett Hardin synthesized the modernized niche concept and Gause’s law, and popularized all of this in in an important 1960 paper entitled The Competitive Exclusion Principle. If you haven’t read it lately, it’s pretty interesting; only six pages. The idea is that when two species compete we can expect behavioral or eolutionary shifts to a different niche, or extinction of the inferior competitor. In And the King of the Surf is… I showed that redtail surfperch, Amphistichus rhodoterus, and silver surfperch, Hyperprosopon ellipticum, are common surfperch in my home waters; they seem to share the surf zone. How has the struggle for existence shaped them? What allows them to coexist? We can start off by asking, do they use the beach in different ways? One way to tackle that is to sample the surf zone repeatedly with standard methods and and examine the catch. Between January 30, 2009 and February 16, 2013, I spent as many days as I could sampling the surf zone with standard hook-and-line techniques. I usually sampled during the incoming tide, moving along the beach, recording the catch at 1-hour intervals. Since I was moving, and the fish were moving, I make the assumption that my 1-hour samples are more or less independent. I made notes on conditions and the catch during 154 1-hour samples. My sampling took me to nearly twenty sandy beaches in central and northern Oregon, USA. 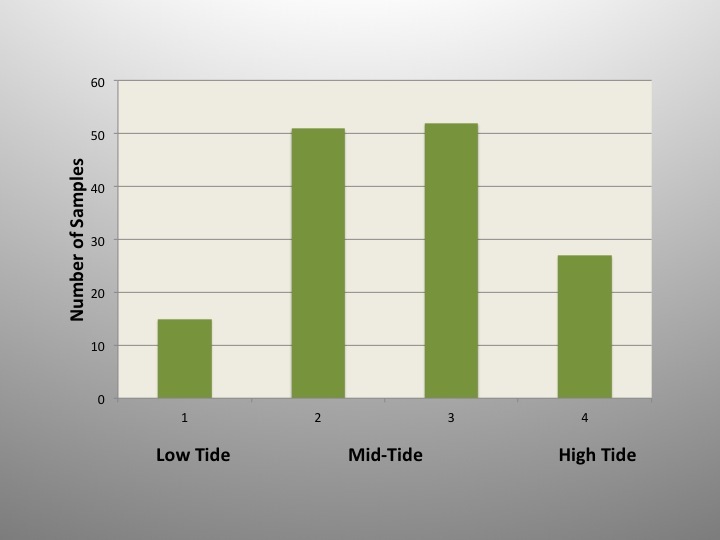 I divided the incoming tide into four categories as you can see in the figure above. The mid-point of category 1 is low tide. This category includes one hour before and one hour after low tide. At the other extreme, the midpoint of category 4 is high tide and it includes the hours just before and after high tide. The mid-point of the incoming tide is between categories 2 and 3. The x-axis then, spans an eight hour period. What you see in the graph above is the distribution of my samples across the incoming tide. You can see I put more effort into mid-tide sampling than into sampling the extremes. If you’re counting, there are only 145 samples here; that’s because 9 samples were taken during the outgoing tide and aren’t shown here. Let’s see how the fishing was. 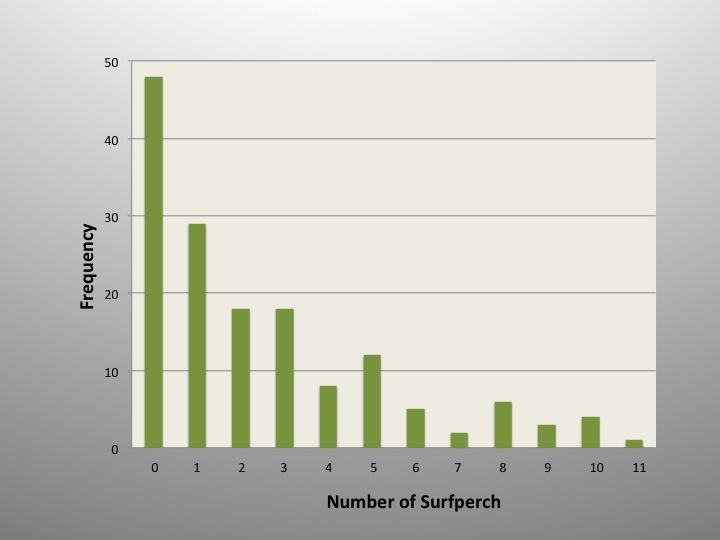 Number of surfperch in 154 1-hour samples in the surf zone. I guess there is a lesson here that plenty of fisherpeople learn early on – the most likely result when fishing is…nothing. But surfperch did show up in plenty of the samples; anywhere from 1 to 11 of them. I guess the way to look at these numbers is kind of like an index of abundance. I found that identifying, sexing, ageing, releasing or otherwise processing surfperch, attending to other fishes, recording notes, maybe snapping a quick photo or two, and dealing with tangled gear all factored into the tally. And that’s just on the beach end of things, there was a lot going on out in the surf too; like were the fish in a biting mood? Do redtails and silvers like my bait equally? All I really know is what came in on the end of my line, and until somebody comes up with a better way to sample the surf zone, I’ll take these results. This study spanned four years; let’s see how sampling went over time. Surf zone sampling success over time. 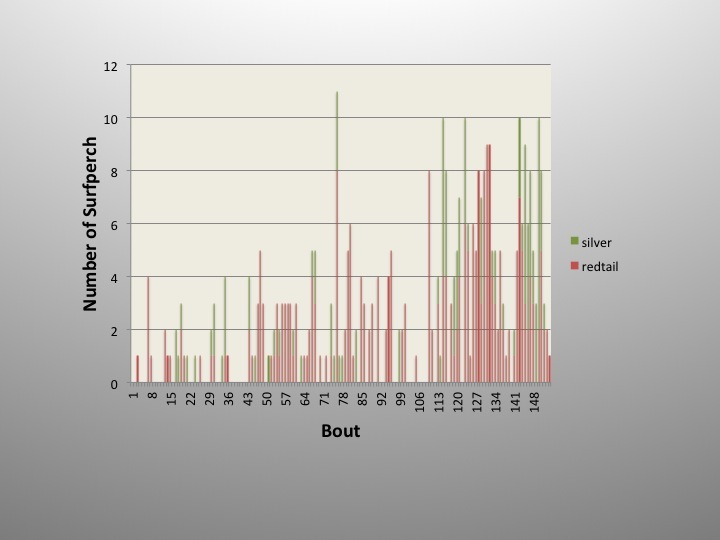 This figure shows sampling success in the 1-hour bouts over time. Bout 1 is the first sample way back in January 2009. On the other end of the x-axis, bout 154 was the last and most recent sample, taken in February 2013. It looks like either surfperch got more abundant over time, or I became more efficient sampling them. It would be fun to test these ideas, but I don’t have any idea how to do that. Keeping hour-by-hour notes allowed me to evaluate an index of abundance across the full range of the incoming tide. Sampling surfperch across the incoming tide. Here, you can see the average number of surfperch in the 1-hour samples at each stage of the incoming tide. Both redtails and silvers are more abundant, or more hungry, near the high end of the incoming tide. That’s something most experienced surfperch anglers might have been able to tell you without this study, but now you can see the evidence. Abundance rises across the cycle of the incoming tide in both species. If we are looking for evidence that the struggle for existence has shaped differences in how these species use the surf zone, we might have to look elsewhere. But where? One thing you might have noticed is that the positive slope of the line describing abundance and tide stage is steeper for redtails than for silvers. When we see lines with different slopes, eventually they must cross. Is there a crossing point and some different relationship on the outgoing tide? Sampling surfperch on the outgoing tide. I only took nine samples on the outgoing tide, so they are lumped here. It’s a small sample but a couple of interesting things show up. 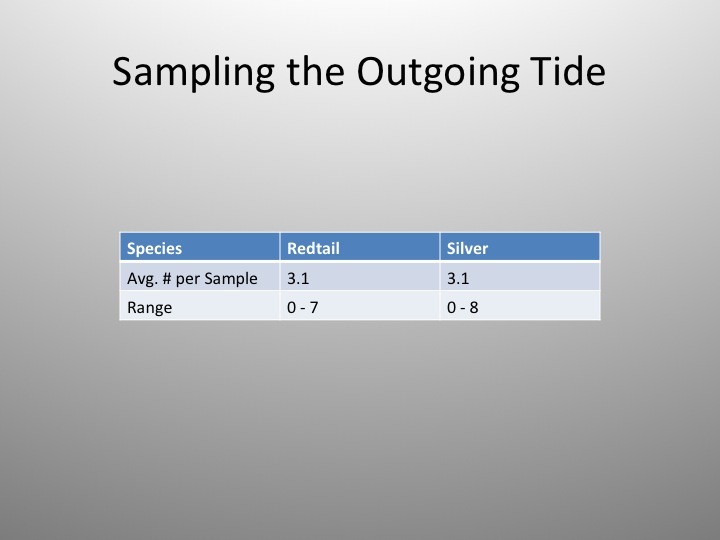 First, redtails and silvers have equal abundance in these samples; we didn’t see that during the incoming tide. Second, both species, especially silvers, are more abundant in these samples than in samples from the incoming tide. 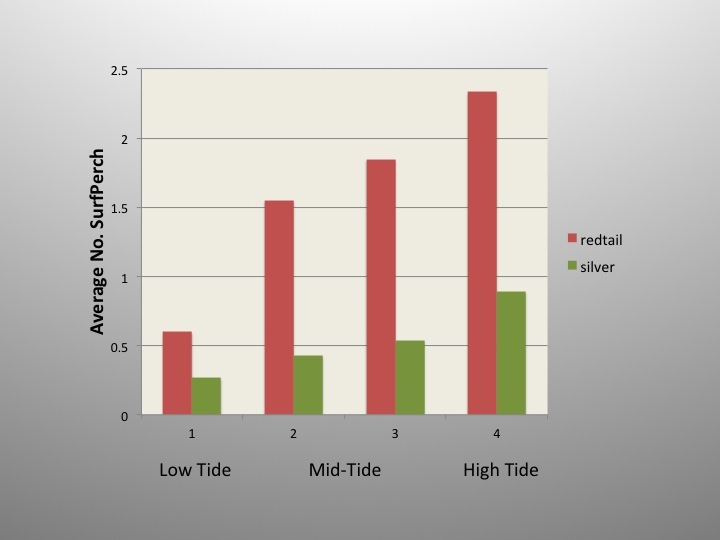 If these results are general and the abundance of silvers relative to redtails really does change with the tides, it may be a clue that the two species use the surf zone differently – a clue to their coexistence on the sandy beaches. Gause, GF. 1932. Experimental studies on the struggle for existence. Journal of Experimental Biology 9: 389-402. Gause, G.F. 1934. The struggle for existence. Baltimore, MD: Williams & Wilkins. Grinnell, J. 1917. The niche-relationships of the California Thrasher. Auk 34: 427–433. Grinnell, J. 1924. Geography and evolution. Ecology 5:225–229. Hardin, G. 1960. The Competitive Exclusion Principle. Science 131, 1292-1297. Hutchinson, G.E. 1957. “Concluding remarks”. Cold Spring Harbor Symposia on Quantitative Biology 22 (2): 415–427. Prev Answering the Clam Challenge: Which Shells for Which Beaches?